Trataka or Gazing Meditation is a cleansing technique taught in hatha yoga, and is traditionally considered ‘dharana’, the fixing of one’s mind on a single point; it’s used as a preparation for meditation. It’s best to do it in the early morning or late evening before bed. Use a good-size flame and do not strain your eyes while gazing. In the beginning your eyes may begin to water after just a couple minutes, but with practice you will be able to gaze for longer periods of time. Set the intention not to blink, but don’t worry if it happens. Eventually, it will settle down. Beginners should only gaze for 1-2 minutes and for general use 5-10 minutes is sufficient. Follow the steps below to practice Trataka. 1. Light a candle and place it 2 to 3 feet in front of you with the flame at eye-level. The flame needs to remain steady, so ensure the room is free from any breezes. 2. Sit in a comfortable position facing the candle. Take a few deep breaths to center yourself and come into the present moment. 3. Focus your eyes on the flame (not on the candle or the wick) and keep a gentle gaze without blinking for as long as you can. Do your best not to move your body during this time. If thoughts arise in the mind, try your best to just be aware of them and then let them go or ignore them. Try to keep your awareness and focus on the flame. 4. When you aren’t able to keep your eyes open and tears flow, close your eyes. With your eyes closed you will see the after-effect of the flame. Keep the eyes closed and just focus on the internal “flame”. 5. After the flame has faded from your mind’s eye, bring your awareness back to your breath. Then slowly open your eyes and repeat the full gazing routine above two or three more times. Benefits: Practicing trataka may cleanse tear ducts, improve vision, concentration, memory and will power. It can enhance self-confidence, increase intuitive capabilities, and stabilize thoughts. It’s also said to ease tension, relieve stress and deepen sleep, and may also help reduce anxiety and depression. Rangoli-Inspired Notebook: This gorgeous notebook is handmade in India from100% recycled paper, and is inspired by the intricate Rangoli designs created to welcome Lakshmi during Diwali. Unscented Soy Candle: Hand-poured by IlluminationStudios in Seattle, these candles will light up the room and the world! They can also be used for the candle-gazing technique described later. Check out IlluminationStudios on Etsy to learn more. Rangoli-Inspired Quilled Candle Holder: Handmade in Colorado, this reusable quilled candleholder fits perfectly around the soy candle to provide added decoration and festivity. Visit ALatteJoy on Etsy to learn more. Rudraksha and Rose Quartz Mala Bracelet: Wearing new clothes and jewelry is a major part of Diwali, so enjoy this bracelet, handmade with love by yours truly, using Rudraksha seeds from India and Lakshmi-inspired rose quartz. For more information on malas visit RisingSolJourneys on Etsy. Pacha Soap: An important aspect of Diwali is cleaning up your house, business affairs, and person. This soap not only smells amazing, but for every bar that’s purchased Pacha gives away a bar. Read more about their Raise the Bar campaign at pachasoap.com. And while you’re there, use the coupon code ASHIPACHA for a 10% discount on any purchases through the end of 2015. Wei of Chocolate: True to all Indian holidays, sweets play a significant role in Diwali. In lieu of traditional Indian sweets, we’ve included incredible organic chocolates with a touch of Himalayan sea salt. Learn more about Lisa, and her connection between meditation and chocolate at weiofchocolate.com. Brass Lakshmi Statue: Lakshmi is the celebrated goddess of Diwali. Feel free to place this Lakshmi ‘murti’ with last month’s Ganesh incense holder as these two deities work together during this auspicious holiday to bring spiritual and material prosperity. Recycled Varanasi Silk Sari: Reuse this Lakshmi-inspired pink sari, perhaps as a headband, in your sacred space or as a decoration around the house to welcome Lakshmi. 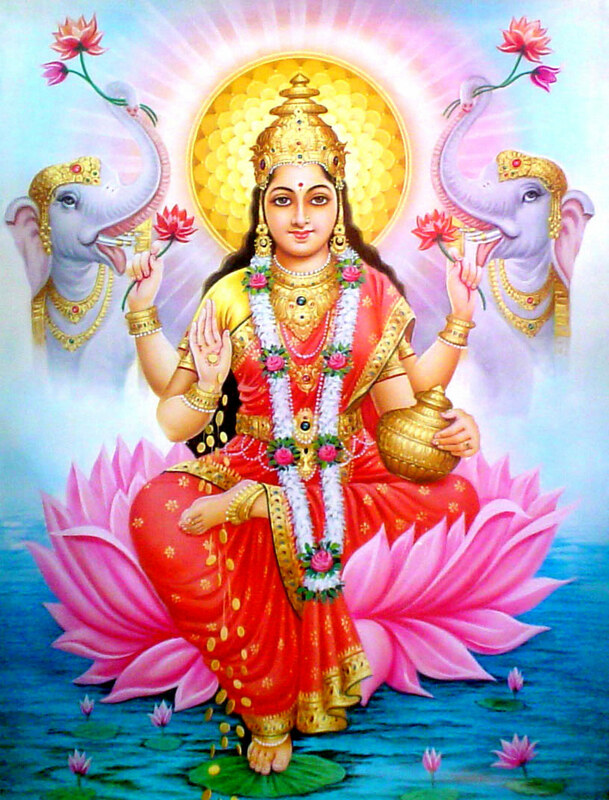 Who is Lakshmi: Lakshmi is the Goddess of abundance, beauty, and pure, sweet love. In addition to being the bestower of these boons, she’s also the force that prepares us to receive them by supporting and allowing us to release any fears that may be holding us back. She works hand-in-hand with Ganesh to bring material and spiritual prosperity and help us overcome our obstacles. She is generally depicted sitting in a lotus and holding lotus flowers in her two hands while the other two hands are in the mudras (hand gestures) of generous giving and protection; she is generally in the presence of two elephants and sometimes seen with Ganesh. She is the consort and dynamic energy of Lord Vishnu and appears with him in all of his incarnations. As we get in touch with the powers of the goddesses, we are able to acknowledge and accept the powers that also reside within us. Lakshmi represents the grace, love, inner-fullness and abundance that already exist within; she embodies self-worth, so anyone struggling with self-esteem issues can call upon her to help them see their inherent strength, beauty, and abundance. It’s with her grace that we are able to polish the lens through which we see the world, in order to see the beauty and goodness all around. She’s there to remind us that “life is good” even in the hard times. Much like the old proverb, which says, “Don’t curse the darkness, light a candle,” Lakshmi is always there to light our internal candles. 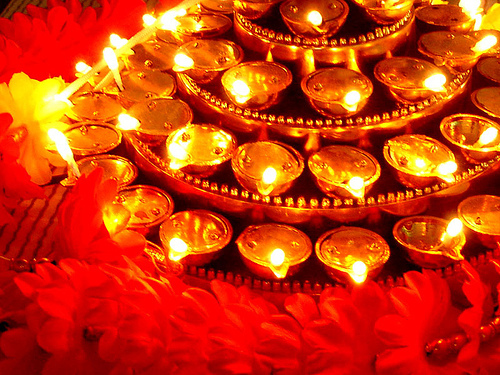 How to celebrate Diwali: Like any holiday, there are myriad ways to celebrated Diwali. Here are some of the more common festivities: 1. Shopping for appliances, utensils, ornaments, jewelry and clothes is usually done on the first day of Diwali (November 9th). 2. Cleaning the house and getting business affairs in order should be completed before the first day of Diwali, but at the very least before Lakshmi Puja on the third night (November 11th). 3. Decorating the house to welcome Lakshmi 4. Wearing new clothes and jewelry on the third day 5. Lighting lamps during all five nights. 6. Performing Lakshmi Puja on the third night. Puja is a ceremony performed in order to seek diving blessings; it can include saying prayers, making offerings, and reciting mantras. 7. Lighting fireworks on the third night. 8. Delivering sweets to your friends and family on the third night. 9. Playing games or cards. 10. Caring for your siblings. 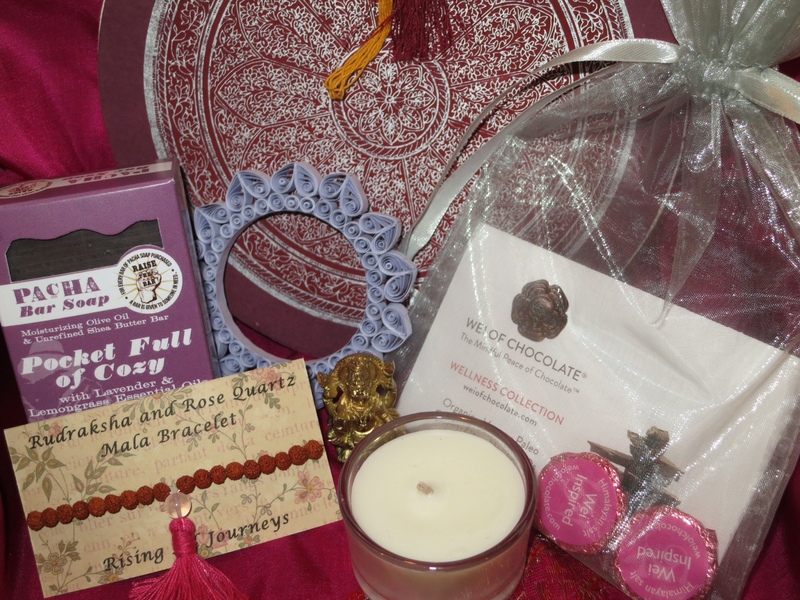 If you’re interested in purchasing a Diwali Ashi Box, which was curated and designed to prepare you for this auspicious holiday, please visit the shop at www.ashibox.com, there are just a couple left!